Do you ever get stuck in a bit of a dinner time inspiration rut? One of the things I’ve struggled with since moving out of my parents house is trying to think of a different, interesting and tasty thing to eat every single day. Sometimes I feel like I’m just cooking more or less the same thing over and over again just out of habit. I’d bought some salmon as I fancied a bit of a fishy weekend dinner. 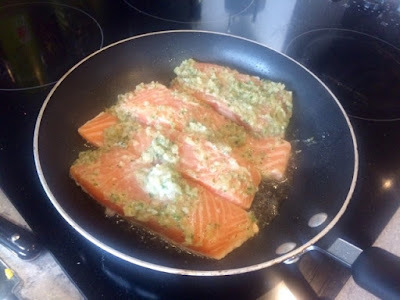 Usually with salmon I would bake it in the oven wrapped in foil with a slice of lemon and then serve it with stir fry veg doused in soy sauce or break it up and stir it into some pasta with some spring veg and either some crème fraîche or a light cheese like feta or mozzarella. Both are perfectly good dinners but both are things I’ve cooked and eaten so many times. I fancied a change. 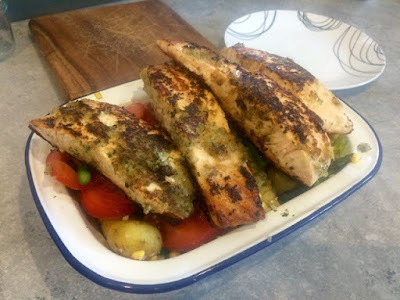 This recipe was inspired by something I found on the BBC Good Food website after searching for ‘salmon’ as an ingredient. I’ve mixed it up a bit and sort of taken the ingredients, added some and cooked it my own way. My favourite aspect of this dish was the salad. 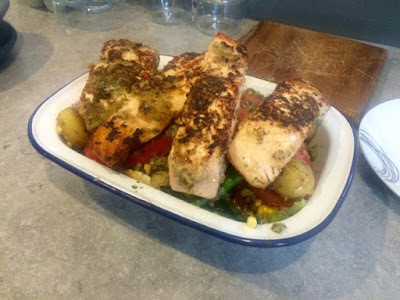 Light enough to make this a good summery meal yet substantial enough with the potatoes to leave you feeling satisfied and not hungry afterwards. 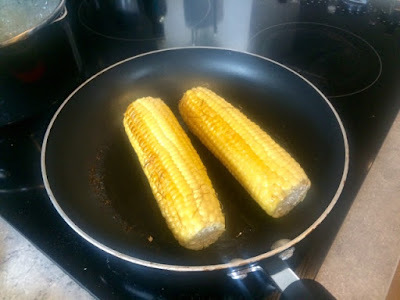 I’ve also never cooked sweetcorn from the cob this way. I’ve obviously had corn on the cob, but when loose sweetcorn is involved in a dish I invariably get it out of a tin. 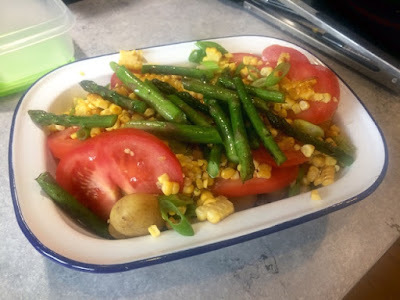 I quite enjoyed doing it this way, it gave more flavour and substance to the corn as an ingredient in the salad with a lightly charred taste. If I had a griddle pan (on my endless wish list) I would have cooked it on the grill rather than in a frying pan just to add to that ‘barbecue’ feel. 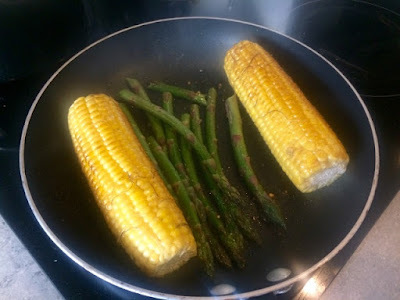 I did wonder if the difference in the corn would be noticeable but The Boyfriend commented and said he preferred it this way so I think I’ll definitely be swapping my tins for cobs in the future. Something that separated this dish from my usual repertoire for me was the dressing. I can be quite unimaginative when it comes to salad dressing and a drizzle of olive oil, squeeze of lemon juice and a splash of balsamic tends to be the norm. 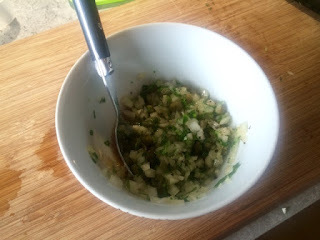 I really enjoyed the red wine vinegar and fresh herby element to this dressing and now I’ve bought the red wine vinegar it’ll definitely be featuring in a few salads on my dinner table in the near future. 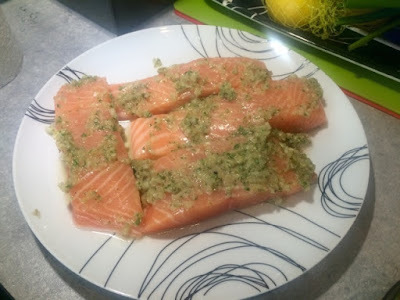 It also made a huge difference to my salmon as my standard marinade for pretty much any meat or fish is garlic, lemon and a random wish mash of herbs and spices, so this made a nice change. I used fresh basil from my ‘herb garden’ (window sill full of pots on my tiny balcony) but I’ll tell you more about that in another post. 1. Put the potatoes on to boil in salted water. 2. Mix all the ingredients for the dressing in a bowl. Finely chopping everything will be fine, but I blended mine just to make it a little smoother. 3. Melt a knob of butter with a glug of oil in a large pan on a medium to high heat. 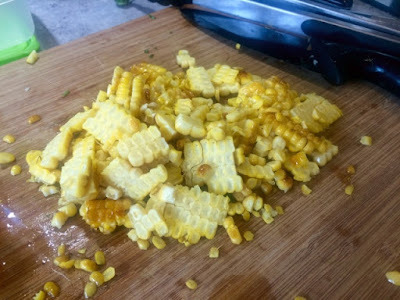 Turn regularly to ensure that you cook the corn evenly. 4. Halfway through throw in the asparagus until slightly charred and cooked through. Remove both vegetables from the pan when done. 5. 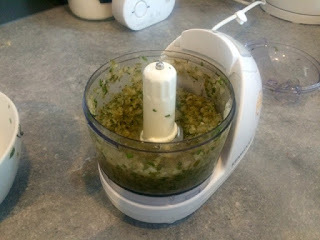 Use about 1 tbsp of the dressing mixture to coat the salmon, rubbing it into the flesh. 6. In the same pan you used for the corn and asparagus, add a splash more oil if necessary and place the fish in skin side down. Cook for about 3 minutes skin side down (or until you can see the fish is cooked to about half way up) before turning over to finish for a further 2-3 minutes flesh side down. 7. Meanwhile, stand the corn on its end and use a sharp knife to cut off the kernels. 8. Your potatoes should be cooked by now so drain them. 9. 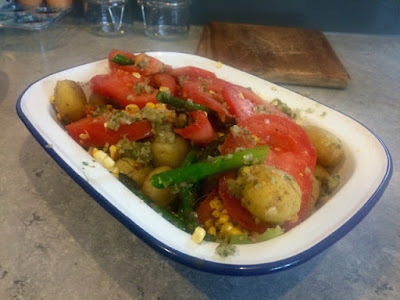 In a large dish combine the cooked potatoes, sweetcorn, asparagus, spring onion and tomato to make your salad. 10. Pour over the remaining dressing and mix thoroughly ensuring everything gets coated. 11. Top with the cooked salmon and serve at the dinner table allowing everyone to tuck in and help themselves.